Welcome to ProcessSCAN™, a division of Stockton Infrared Thermographic Services, Inc. We hope you find this site interesting and informative. Over the past twenty years or so, infrared thermography (IRt) has gained acceptance as the way to check electrical circuitry for loose connections and other unsafe and wasteful conditions. This is a proven application and what the majority of infrared service providers do for a living. However, there are many uses for infrared thermography other than inspecting electrical switchgear and beyond the capabilities of the average electrical infrared service company. In fact, the future of infrared thermography and the place where the greatest potential for savings can be found is in the manufacturing sector and specifically in the area of product quality assurance and process improvement. There are simply more savings to reap on production equipment than any other application, including Infrared Predictive/Preventive Maintenance (IR P/PM). Let’s say your manufacturing plant has 20 of the same or similar widget machines. Each has a total annual output of 100,000 widgets-a total plant output of 2,000,000 widgets with 1/5th of 1% product returns of 4000 widgets. Working together on only one machine, a production engineer and ProcessSCAN thermographer find and solve three problems that increase production just 10% and reduce product returns by just 5%. The return on investment (ROI) is tremendous, because after that machine has been improved, the other 19 machines can be similarly adjusted, increasing total plant productivity 10% (or 200,000 widgets annually) and decreasing product returns to your customers. This site contains plenty of examples and videos of these types of applications. Check out the site and call an IR thermographer at 800-248-7226 to schedule a site visit. Our thermographers are trained and experienced in the practice of infrared machine vision technology. We have the latest IR equipment and software and want to save you money. 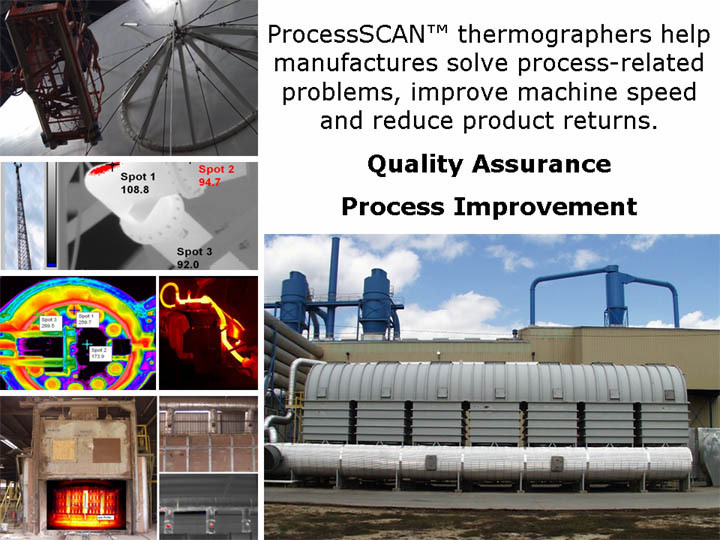 ProcessSCAN™ does not sell infrared systems, so we can provide unbiased process solutions and systems recommendations for process monitoring and on-line IR systems through our consulting serviceS.